Create a website has made this time of my life absolutely fascinating. After retiring in December 1993 and returning to my country of birth I then decided in January 2008 to create a website and work from home and provide people with a home based business opportunity – what a difference this has made in my life! I have formed invaluable friendships within Australia and also Europe. Provided information on health and other issues enabling them to do their own research and make their own health choices. Making healthy choices enables a person to live a much healthier life! With absolutely no knowledge of web building or html (what on earth is that? ), in fact, apart from word processing and spreadsheet knowledge – no experience whatsoever! What an exciting time it has been creating a website. My home based businesses have become alive in my website and this will allow me to make money on line and to provide me with the financial support to enable me to live the lifestyle that I would love to have. Here is another lady’s experience. 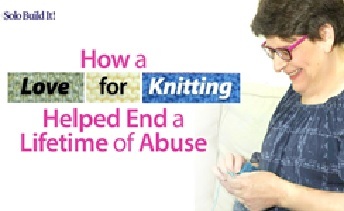 Here is the link showing how her passion for knitting helped end a lifetime of abuse. This YouTube will show you everything you need to know to build an online business and have as much fun as I am! your normal day to day business – could it do with some internet space? Whatever the reason - Would you like to own your own Site Build It Website and create a website just for you? Does this sound daunting to you? It doesn’t have to be! Recently I decided to join SBI Website’s 5 Pillar Affiliate program – this cost me nothing but my time. What I have found on becoming a 5 Pillar Affiliate is that I can now offer YOU all the benefits that I have found. If you too would like to become a 5 Pillar Affiliate – click on the link below. I used to do library reading to the children at school - would this interest you? Click on the link below to see what possibilities are open for you. What sort of passions do you have? Are you involved in a hobby that you would like to share with other people? Do you have a message to tell the world! Would you like to be able to make money online by using a website, such as Solo Build It Website? Can you think of a good reason for you to own your own website and be able to do your own thing? Now is your chance to do whatever you would like to. Click on the link below for more details. Are you interested in running what is commonly called an E-Business? e-books – have you thought of writing your own e-books? Are you interested in being an on-line Auctioneer? What did you think of all the fantastic opportunities that were open to you? I believe that Solo Build It is one of the best providers of websites. Your website will only ever be as good as the effort you put into building it! Will you be a dare devil and take the plunge and do something you have never done before? Click on the Icon found at the bottom of this page and have a listen to what Ken Evoy says about Solo Build It. Would love to see your website when you have it up and running and to hear your success stories. Contact me in the email form below.